Looking for an island vacation on the US mainland for your upcoming honeymoon? Consider visiting funky-cool Folly Beach, SC, a quirky island located just 15 minutes from Charleston. This beautiful barrier island has a small town vibe with a sun-drenched, salt-in-your hair, flip-flop casualness. A place where the stunning natural beauty of the Atlantic Ocean combines with coastal Carolina charm. Where the living is easy, the surf is up and the fish are always biting. Where dolphins frolic and bald eagles soar, where million dollar beachfront mansions nestle next door to vintage beach shacks. Where a cast of interesting characters saunter down the one main street in town, Center Street. Where there is only one high rise hotel and the restaurants are locally owned and operated. A place free of billboards and office towers, but full of local dives and sandy beaches. Visit Folly once and you’ll be hooked. It will stay with you. During cold winter months you’ll think back to that perfect beach vacay you and your honey had: walking in the sand, grabbing a meal at Taco Boy, falling even more in love, soaking in that sunshine, and you will start making plans to return. Soon. Locals have a rule they live by, “Relax..Slow Down.” Folly Beach, known as The Edge of America, is truly one of the most relaxing places on Earth. A place where you can escape the ordinary alongside a diverse culture of free-spirited people like the artists, skaters, musicians, surfers, and others who come to the island to live a laid back lifestyle. So this is a place where kicking back and chilling are a way of life. It is easy to join in, put your toes in the sand and take things nice and slow when you visit this eclectic, bohemian, small town. All of the beaches on the island are next-level, but definitely check out the Folly Beach County Park, on the west end. This slice of paradise boasts 2,500 feet of ocean frontage and if you get there when it’s not busy you’ll feel like you are on your own private island. They offer picnic areas, and you can rent boogie boards, bikes and umbrellas. Surfing is big on Folly and it is a major influence on the island culture. Folly, with the best waves on the East Coast, is the surfing mecca of South Carolina. Surfers can be found early in the morning riding the epic waves at The Washout or the Folly Beach Pier. Local establishments predominate on the island, which makes visiting here so unique. You won’t be eating at Pizza Hut and shopping at Krogers on Folly. One of our favorite stops is Bert’s Market. This crazy cool shop is open 24/7 and serves food, snacks, surfboard wax, and grocery items to surfers, skaters, tourists, hipsters and locals alike. They have the best key lime pie in the entire world for $5.99 a slice, too. Spend some time hanging at Bert’s and you will be sure to people from all walks of life. One thing that unites the diverse types of people, though, will be their happy faces and awesome attitudes. This is a place where it is easy to be stress-free. When it comes time to eat, you’ll want to be doing that in your new favorite restaurant: Taco Boy. Their motto is “Skip Siesta, Let’s Fiesta,” and their delicious food is made fresh from mostly locally and regionally sourced products. We suggest you start with an Appetizer Trio which includes. Jalapeño tomato salsa, chile con queso & guacamole. Oh, and you’ll also be needing a Michelada: your favorite Mexican beer, served with house-made Sangrita-mix over ice with a salted rim. Don’t worry if you want to try everything on the menu, you’ll be back, you’ve got time. You will also want to visit the Lost Dog Cafe, a place where locals and tourist meet and mingle. This casual beach cafe serves killer breakfast all day like huge burritos and bagel sandwiches along with extra good coffee. You’ll need to visit the Folly Beach Pier, one of the longest piers on the east coast during the day AND in the evening. It’s a wonderful place to experience the ocean breezes, watch for dolphins, stroll around and just take in the spectacular views of the “Edge of America.” Officially named the “Edwin S. Taylor Folly Beach Fishing Pier,” this structure offers some of the best saltwater fishing in the area. The pier is a breathtaking landmark that stretches 1,045 feet into the sparkling waters of the Atlantic Ocean. 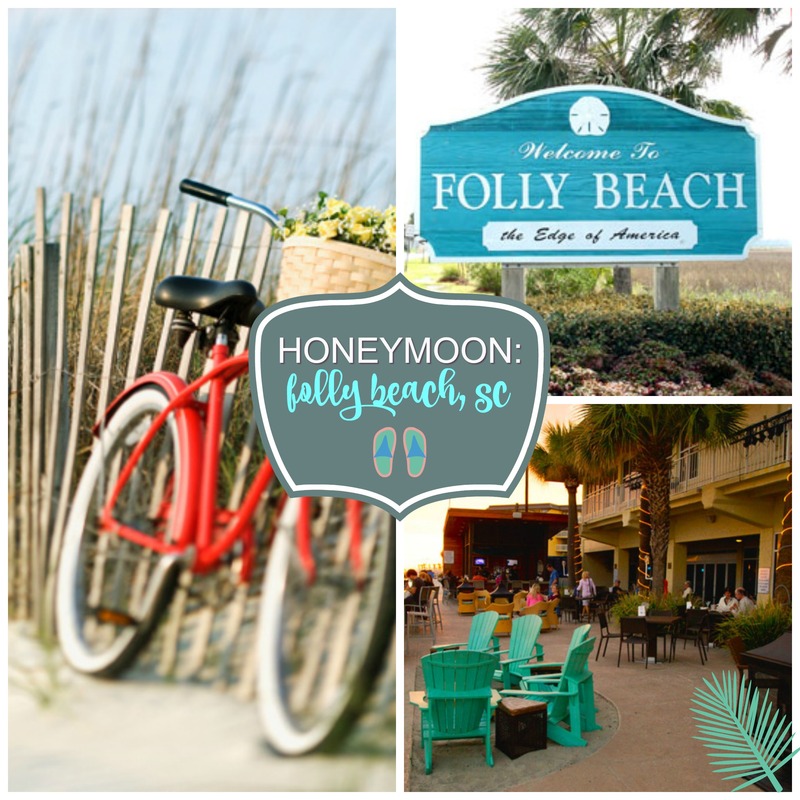 Folly Island offers something for everyone. You can be a beach bum, take a day trip into nearby Charleston, or be adventurous. You can kayak around Folly Beach and James Island, jet ski, parasail or ride a bicycle along Folly’s six miles of beachfront. Or you can rent a golf cart and just drive around at your leisure. Whatever you choose to do on your honeymoon, it will be an unforgettable experience on this little slice of heaven! Check out Visit Folly for more info. Also read Travel & Leisure’s Folly Beach Travel Guide.